One of the most devastating diseases that impacts us as we age is Alzheimer’s. An estimated 5.7 million Americans have some form of the disease, and most of us have a friend or relative who is suffering with this cruel illness. The Alzheimer’s Association is the leading voluntary health organization supporting research and care associated with the disease. 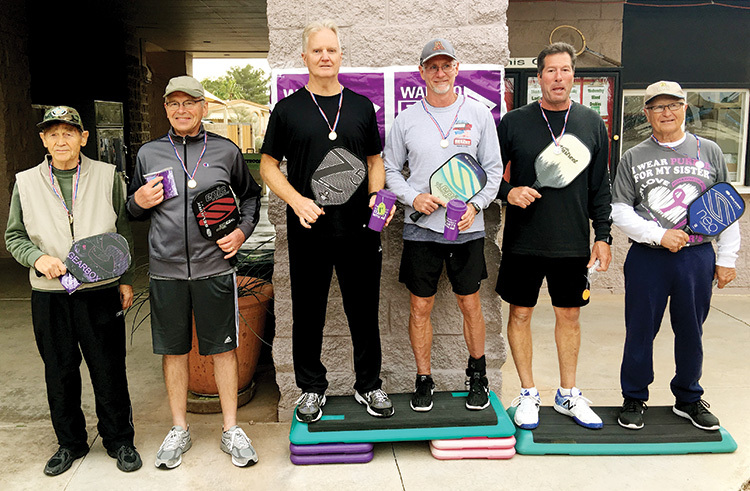 The SunBird Pickleball Club made a decision to support the Alzheimer’s Association by donating funds raised from sponsoring a competitive two-day pickleball event in our community. Enthusiasm ran high, and a total of 170 competitors signed up to play, paying an entrance fee of $20 each. Vendors were invited to display their wares, and the courts were decorated with flags and posters in the “Pickle for Purple” colors. There were many donated baskets of goodies displayed for raffle, both in the clubhouse and courtside. Tickets sold like hot cakes! The games began at 8:00 a.m. on a very cold and cloudy Saturday morning and continued through 6:00 p.m. that day. Sunday proved to be a much warmer day, and the participants continued to play to win throughout the various divisions. To add to the excitement, four Level 5 (almost pro!) players were invited to play, and they put on a magnificent display of how the game is played at the professional level. Truly an amazing display of what can be achieved with years of practice and dedication. The total funds raised during the two-day event was an impressive $7,355, a huge increase over last year’s efforts! On February 13, a check for $1,000 was presented to Layne Varney, Manager of SunBird, for The Neighbors Helping Neighbors fund. The remaining $6355 was donated to the Alzheimer’s Association on behalf of the Sunbird Pickleball Club. Dan and Marianna Buescher, who planned and coordinated the “Pickle for Purple” charity event, wish to thank all the many volunteers who helped make this endeavor such a huge success. Where there is need, SunBird residents have a history of responding, making this year the best ever!